Birth Name: Marlon Brando, Jr.
Marlon Brando was an American actor, film director, and activist. He twice won the Academy Award for Best Actor, for On the Waterfront (1954) and The Godfather (1972). Marlon was the son of Dorothy Julia (Pennebaker), who had also acted, and Marlon Brando, a pesticide manufacturer. His sister, Jocelyn Brando, was also an actress. He had at least sixteen children, including actor Miko Brando, actress Rebecca Brando, and model Cheyenne Brando. Among his grandchildren is model Tuki Brando. Marlon’s ancestry included English, as well as Irish, German, Dutch, French Huguenot, Welsh, and Scottish. His patrilineal line traces back to Johann Wilhelm Brandau, who was born, c. 1670, in Palatinate, Germany. The surname was changed to Brandow, and later to Brando. 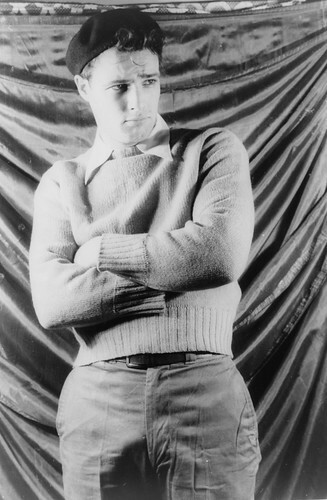 Marlon’s paternal great-great-grandfather, Apollos/Paulus Brando, was of at least half German ancestry. Marlon mentioned the origin of his surname in his autobiography, Songs My Mother Taught Me. Despite being well known for his role in the film, The Godfather, about Italian-American mobsters, Marlon was not of Italian ancestry. Marlon’s paternal grandfather was Eugene Everett/Everet Brando (the son of James Henry Brando and Nancy Hannah Joslin/Jocelyn). Eugene was born in New York. James was the son of Apollos/Paulus/Paul Brandow/Brando and Catherine Van Orden/VanOrden. Nancy was the daughter of James Joslin/Jocelyn and Charity Denslow or Granger. Marlon’s paternal grandmother was Marie/Maria Belle Holloway (the daughter of Robert Thomas Holloway and Catherine Emily Thompson). Marie was born in Illinois. Robert was the son of George Holloway and Mary Polly McClanahan. Catherine was the daughter of James Thompson and Elizabeth Ewing. Marlon’s maternal grandfather was William Johnson/John Pennebaker (the son of William Pennebaker and Sarah Elizabeth Salmon/Solmon). Marlon’s grandfather William was born in Missouri. Marlon’s great-grandfather William was the son of Samuel W. Pennebaker and Sarah Finley. Marlon’s great-grandmother Sarah was the daughter of Ezekiel James Salmon and Narcissa Ragsdale Merritt. Marlon’s maternal grandmother was Bessie Grace Gahan (the daughter of Myles Joseph Gahan and Julia A. Watts). Bessie was born in Nebraska. Myles was born in Dublin, Ireland, the son of Edward Gahan and Grace Mauley. Julia was the daughter of Thomas Watts and Mary Locke. His sister, Jocelyn Brando, was also an actress. Also can you note that his direct patrilineal ancestor was from Palatinate, Germany.